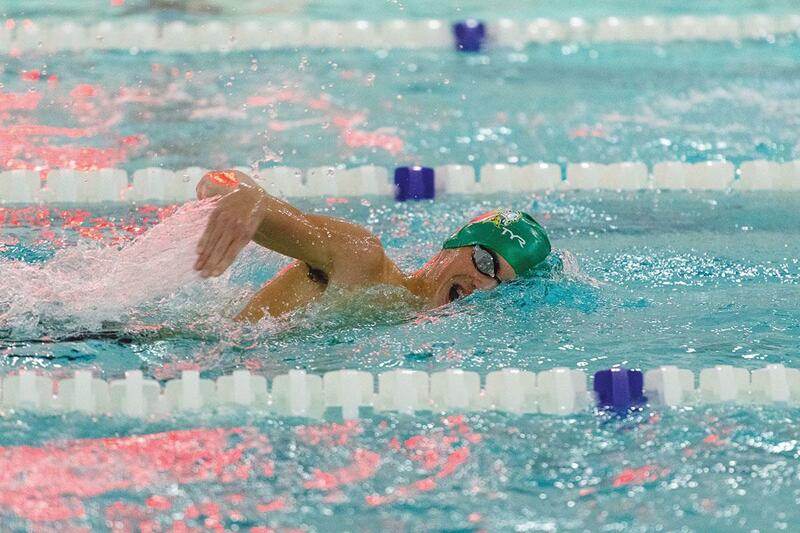 Declan Burke shows good breathing technique during a swim versus Sussex Academy earlier this season. Last week, the Indians boys rolled over Milford 110-57, to remain unbeaten in the Henlopen Conference South Division. Against the Buccaneers, IR won all but one of the events contested. Seniors Mitch McGee and Michael Barnes, along with sophomore Declan Burke, were four-time winners for the Indians. The trio was joined by Dylan Tuttle to win the 200 medley relay in 1:51.77, accounting for one of their first-place efforts. McGee picked up individual wins in the 100 butterfly (1:05.13) and 500 free (6:04.91). He also swam a leg — as did Burke — on the victorious IR team in the 200 free relay (1:37.18), with William Douds and Max Kohr. Burke was an individual winner in the 200 IM (2:20.71) and the 100 free (52.82) events, while Barnes finished first in the 50 free (22.96) and 100 back (1:04.12). Tuttle also garnered an individual win for himself in the 100 breaststroke, with a time of 1:09.29. Barnes, Douds, Kohr and Zach Lingenfelter were tops in the 400 free relay (3:57.45) to round out the successful performance for the Indians. The IR girls’ swimming team swam a strong meet against host Dover in picking up a 53-40 decision to even their mark at 4-4 for the season. The Indians won seven of the 11 events in the meet, with Emma Barthelmess in the mix for four of those wins. Emma Kelly and Alex Hall figured in on three wins for IR. Barthelmess swam a victorious leg in both the 200 medley relay and 200 free relay, while picking up individual wins in the 200 IM (2:42.85) and 100 breaststroke (1:20.24) events. Hall, Kelly, Barthelmess and Amber Hills covered the 200 medley relay in 2:21.13 for the win. Hills, Hall, Barthelmess and Maelyn Bryan won the 200 free relay (no time posted). Hall was first in the 50 free (29.54), while Kelly’s 1:23.58 was the best time in the 100 back. Kelly, Kaitlyn Kreiser, Nadia Czyzewski and Madison Bemis won the 400 free relay in 5:12.00. Against Milford on Thursday, Jan. 10, the IR girls came up short against the Buccaneers, 92-66. Hall was a winner in the 50 free (29.14), while Barthelmess was first in the 100 breaststroke (1:19.58). Kreiser, Hall, Kelly and Hills swam to a win in the 400 free with their time of 4:56.44. It was a tough week for the Indians’ in girls’ basketball, as they dropped two games last week, to Lake Forest and Sussex Central. On Thursday, Jan. 10, the Indians fell behind early, trailing 15-8 to Lake after the first quarter. The Spartans made it 28-10 at the break. Lauren Meehan led the Indians, with six points, while Julia Jordan and Kayley Belzner each chipped in with four. Then, on Tuesday, Jan. 15, IR again found itself in an early hole, falling behind 20-9 in the first quarter and 29-13 at the halftime intermission. Jordan led five Indians scorers, with nine points. Savannah O’Shields and Yonya Wise both added four points to the effort. Micayla Meehan and Lauren Meehan rounded out the IR scoring with three and two points, respectively. IR — at 5-8 overall on the season — were set to travel to Laurel on Thursday, Jan. 17, (after Coastal Point press time), for a contest with the Bulldogs. Results for that game will be found on the Coastal Point sports Facebook and Twitter pages.